A typical roast is served up with a hefty side of carbs, mostly potatoes and if you’re following a keto diet you already know potatoes aren’t low carb. So we got rid of them. No one said you can’t enjoy pork roast sans potatoes because you can. This low carb, keto friendly Pork Roast has an insanely tasty flavor profile and is loaded with health benefits. It helps boost your gut health and digestion, helps fight against cancer, and nourishes your skin, just to name a few. 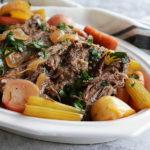 And what more can you ask for from a pot roast? Not much. This pork roast is brimming with ingredients that are both great for your overall health and your body’s ability to defend against cancer. When adding butter to your meal, it’s vital to choose Grass-fed butter. The reason being because research has shown that conjugated linoleic acid (CLA) is produced from cows fed on grass. CLA has been linked to reducing the risks of various cancers [*]. Celery and Carrots are in the same Apiaceae plant family. These nutrient dense vegetables are loaded with properties that aid in the fight against cancer, most specifically Polyacetylenes. These Polyacetylenes have been shown to fight against various cancers including leukemia [*][*][*][*]. Another forceful vegetable in the fight against cancer is the Radish. Radishes are cruciferous vegetables which generate isothiocyanates that aid in your bodies ability to fight against cancer. Research has shown that these isothiocyanates can prevent tumor production and even kill certain cancer cells [*][*]. You might think that bay leaves are just for decoration or taste, but they actually provide powerful health benefits including anti-cancer properties. Studies have linked the nutrients found within bay leaves to helping fight against breast and colorectal cancers [*][*]. Garlic is an incredible ingredient in the prevention of cancer. It contains a compound called N-benzyl-N-methyl-dodecan-1-amine (BMDA for short). One study was able to extract this compound by the reductive amination method and was found to have a very promising anticancer properties against cancer cells overgrowing [*]. The nourishing ingredients in this pork roast provide a mighty boost for your overall digestive health. Celery is excellent for digestive health. The high amounts of water and fiber deliver hydration and cleansing to your gut. Additionally its antioxidants and anti-inflammatory properties aid in overall digestive health. Similarly, Radishes are a valuable source of fiber. Research has shown how radishes can aid in digestive flow, regularity, and overall gut health [*]. Adding bone broth to this meal gives a boost of essential aminos acids and collagen/gelatin, which are great for your gut health. These work in conjunction to help seal up any openings in your gut lining (aka leaky gut syndrome). Apple Cider Vinegar is rich in healthy bacteria, that can aid in your digestion. The bacteria in ACV can aid in nutrient absorption and strong immunity within the gut. Bay Leaves can even aid in digestive health. They specifically act as a diuretic and help promote urination that enables your body to eliminate harmful toxins. They can also ease stomach pains and digestive discomfort [*]. Apple Cider Vinegar has been shown to fight against skin issues such as acne. Through it’s antibacterial abilities, ACV can provide nourishment and protection to your skin [*][*][*][*]. Carrots are rich with beta carotene which delivers powerful nourishment to the skin. Research has shown how beta carotene can boost your skin’s ability to heal wounds and improve overall strength and anti-aging capabilities [*]. Radishes provide rich amount of various nutrients that are beneficial for your skin, including vitamins B and C, phosphorus, zinc, and antibacterials. Additionally radishes are water dense, providing much needed hydration to your skin [*]. Don’t forget to add this recipe to your monthly meal plan of low carb recipes. Serve this delicious dish with some of our low carb Cloud Bread and finish off your meal with a slice of Keto Pumpkin Pie. This Pork Roast is a great dish for the entire family to enjoy and perfect for any Holiday gathering. 1. Turn Instant Pot ON and set to SAUTE function +10 minutes. Add butter to the bottom of the pot and let heat for 1 minute. Sear roast on both sides until caramelized and browned. 2. Add broth, apple cider vinegar, garlic, bay leaves, salt, and pepper. Turn Instant Pot OFF, then back ON, set to MANUAL +60 minutes. Return lid and close valve. 3. When timer goes off, release pressure manually and remove lid. Add baby carrots, radishes, and celery. Replace lid, close valve, and set to MANUAL +25 minutes. When timer goes off, release pressure manually. Roast should be fork tender. If it is not, add an additional 10-20 minutes cooking (MANUAL setting). Adjust seasoning (salt/pepper) to taste if needed. If you don’t own an Instant Pot, you can use a slow cooker. Just saute the roast in a pan then add the roast to the slow cooker along with the remainder of the ingredients on a low temperature for 8 hours. While this recipe seems simple and sounds tasty, macros wise it seems to be low fat and high protein.